The only Public House in Quarter was originally called, so the story goes, The Bellerophon Inn. The original name came from one of Nelson's ships during the battle of Trafalgar in 1805 and in 1862 the first ship built to a new design of shorter, handier ships, divided into watertight compartments, was constructed and called the Bellerophon. In 1909 a ship of the Dreadnought type was built at Portsmouth called the Bellerophon. She was present at the battle of Jutland and after the First World War she was reduced to reserve or subsidiary duties. The name Bellerophon is from the Greek Mythology, the son of Glaucus, King of the Corinth; he was the hero who tamed the winged horse Pegasus with the aid of a bridle given to him by the goddess Athena. It was recalled by Mr. Tom Reid that a small picture on the back gate of the old inn was of a winged horse and that the Bowling Club has a trophy called the Bellerophon Trophy and a winged horse as their emblem. Nicknames in the Navy for various ships are legend and some are merely mispronunciations and others seem to have no obvious origin. For ages past the ships of the navy have been christened with most extraordinary names; it is in a way a sign of affection in the same way that popular people usually acquire one. The Naval nickname for the old Bellerophon was always the "Billy Ruffian" or "Bally Ruffian". The local dialect probably did the rest as Billy can be heard by outsiders as Bully with a harsh U and Ruffian "having no part in Quarter!" was dropped to become just The Bully Inn. Another explanation of the name is from the William Wallace book “To Drink or Not To Drink” about Pubs in and around Hamilton. And I quote “Up at Quarter an Inn seems to have taken its name from the first Quarter mine – The Old Bellerophon. 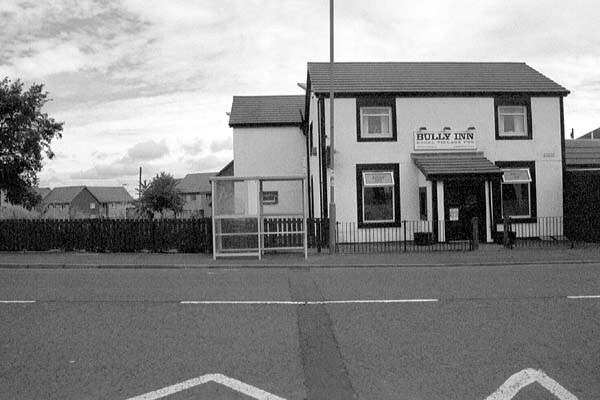 Through the vagary of accent the name of the place seems to have changed to The Bully Inn when the first Irish immigrant miners arrived.